A plane carrying relief items has arrived in Luanda, Angola, to assist over 11,000 people who fled a recent surge violence in the Democratic Republic of Congo (DRC), the United Nations refugee agency said today. The aircraft landed Sunday morning from Dubai, carrying 3,500 plastic sheets as well as 100 plastic rolls to provide shelter during the rainy season, 17,000 sleeping mats, 16,902 thermal fleece blankets, 8,000 mosquito nets, 3,640 kitchen sets, 8,000 jerry cans and 4,000 plastic buckets. 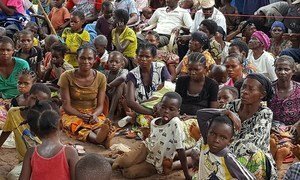 The Office of the UN High Commissioners for Refugees (UNHCR) will be airlifting more relief items to Angola in coming days. The brutal conflict in DRC's previously peaceful Kasai region has already displaced more than one million civilians within the country since it began in mid-2016. The border is managed by the Angolan army. UNHCR has requested the Government to allow refugees to continue crossing the border, provide unhindered access to assist new arrivals, as well as not to return people fleeing the violence to the DRC. Angola is currently hosting some 56,700 refugees and asylum-seekers, of whom close to 25,000 are from the DRC. UNHCR Angola had an initial annual budget of $2.5 million to protect and assist some 46,000 people of concern. In response to the current emergency, UNHCR is appealing for a total of $5.5 million to provide immediate lifesaving assistance. The United Nations has appealed for $64.5 million to respond to the urgent needs of 731,000 people over the next six months in the Kasaï region, the latest “humanitarian hotspot” in the Democratic Republic of the Congo (DRC).